Dunfermline is an old and famous town with an ancient Celtic church and abbey and is the birthplace of billionaire, Andrew Carnegie. The town is situated above the Firth of Forth and about 15 miles north of the capital Edinburgh. The abbey and royal palace are big attractions here, but many also visit Dunfermline for the magnificent nearby countryside views it offers. Located next to the beautiful Pittencrieff Park to the west of the town are the Dunfermline Abbey and the once-Royal Palace; a statue of Mr. Carnegie stands proud in the park. The Royal Palace was a splendid structure in its day, yet only the southwest wall remains, while the abbey which was constructed on the site of a 6th century Celtic church has some startling features. It comes with flying buttresses, as well as Robert the Bruce’s and Queen Margaret’s tombs. Possibly the biggest draw to Dunfermline for many will be the legacy of Andrew Carnegie seen at the Andrew Carnegie Birthplace Museum. Carnegie was the son of a humble weaver and in the museum grounds is the 18th century cottage of his birth, and a memorial hall. Contained in the ‘museum to the then richest man in the world’ are the great man’s place of birth (cottage) and the story of his life. One of Andrew Carnegie’s many great virtues was his unending generosity and he has founded numerous libraries all over the world, including many civic buildings in Dunfermline. Carnegie Hall offers a busy program of performing arts throughout the year in this beautiful 1930s theater. Other nearby attractions within an hour of Dunfermline is the wonderful capital, Edinburgh, bustling Glasgow to the southwest and the outstanding Loch Leven and Loch Leven Castle to the north. 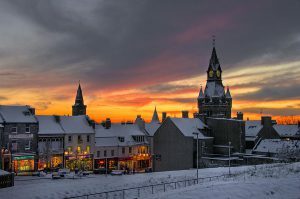 Dunfermline also has some good shopping areas and plenty of restaurants and pubs.